Frank Morgan as Marvel, Wizard, etc. As a child I simply did not notice whether a movie was in color or not. The movies themselves were such an overwhelming mystery that if they wanted to be in black and white, that was their business. It was not until I saw "The Wizard of Oz" for the first time that I consciously noticed B&W versus color, as Dorothy was blown out of Kansas and into Oz. What did I think? It made good sense to me. The switch from black and white to color would have had a special resonance in 1939, when the movie was made. Almost all films were still being made in black and white, and the cumbersome new color cameras came with a “Technicolor consultant” from the factory, who stood next to the cinematographer and officiously suggested higher light levels. Shooting in color might have been indicated because the film was MGM's response to the huge success of Disney's pioneering color animated feature, "Snow White and the Seven Dwarfs" (1937). If “Wizard” began in one way and continued in another, that was also the history of the production. Richard Thorpe, the original director, was fired after 12 days. George Cukor filled in for three days, long enough to tell Judy Garland to lose the wig and the makeup, and then Victor Fleming took over. When Fleming went to “Gone With the Wind,” King Vidor did some of the Munchkin sequences, and the Kansas scenes. There were cast changes, too; after Buddy Ebsen, as the Tin Man, had an allergic reaction to the silvery makeup, he was replaced by Jack Haley. Musical numbers were recorded and never used. Margaret Hamilton (the Wicked Witch of the West) was seriously burned when she went up in a puff of smoke. Even Toto was out of commission for two weeks after being stepped on by a crewmember. We study all of these details, I think, because “The Wizard of Oz” fills such a large space in our imagination. It somehow seems real and important in a way most movies don't. Is that because we see it first when we’re young? Or simply because it is a wonderful movie? Or because it sounds some buried universal note, some archetype or deeply felt myth? I lean toward the third possibility, that the elements in “The Wizard of Oz” powerfully fill a void that exists inside many children. For kids of a certain age, home is everything, the center of the world. But over the rainbow, dimly guessed at, is the wide earth, fascinating and terrifying. There is a deep fundamental fear that events might conspire to transport the child from the safety of home and strand him far away in a strange land. And what would he hope to find there? Why, new friends, to advise and protect him. And Toto, of course, because children have such a strong symbiotic relationship with their pets that they assume they would get lost together. They're touching on the key lesson of childhood, which is that someday the child will not be a child, that home will no longer exist, that adults will be no help because now the child is an adult and must face the challenges of life alone. But that you can ask friends to help you. And that even the Wizard of Oz is only human, and has problems of his own. Judy Garland had, I gather, an unhappy childhood (there are those stories about MGM quacks shooting her full of speed in the morning and tranquilizers at day's end), but she was a luminous performer, already almost17 when she played young Dorothy. She was important to the movie because she projected vulnerability and a certain sadness in every tone of her voice. A brassy young child star (a young Ethel Merman, say) would have been fatal to the material because she would have approached it with too much bravado. Garland’s whole persona projected a tremulous uncertainty, a wistfulness. When she hoped that troubles would melt like lemon drops, you believed she had troubles. Her friends on the Yellow Brick Road (the Tin Man, the Scarecrow, the Cowardly Lion) were projections of every child's secret fears. Are we real? Are we ugly and silly? Are we brave enough? In helping them, Dorothy was helping herself, just as an older child will overcome fears by acting brave before a younger one. The special effects are glorious in that old Hollywood way, in which you don't even have to look closely to see where the set ends and the backdrop begins. Modern special effects show *exactly* how imaginary scenes might look; effects then showed how we *thought* about them. A bigger Yellow Brick Road would not have been a better one. The movie's storytelling device of a dream is just precisely obvious enough to appeal to younger viewers. Dorothy, faced with a crisis (the loss of Toto), meets the intriguing Professor Marvel (Frank Morgan) on the road. She is befriended by three farm hands (Bolger, Haley and Lahr). Soon comes the fearsome tornado. (What frightened me was that you could see individual things floating by--for months I dreamed circling around and around while seated at the little desk in my bedroom, looking at classmates being swept mutely past me.) Then, after the magical transition to color, Dorothy meets the same characters again, so we know it's all a dream, but not really. There are good and bad adult figures in Oz--the Wicked Witches of the East and West, the Good Witch Glinda. Dorothy would like help from her friends but needs to help them instead (“If I Only Had a Brain,” or a heart, or nerve, they sing). Arriving at last at the Emerald City, they have another dreamlike experience; almost everyone they meet seems vaguely similar (because they’re all played by Morgan). 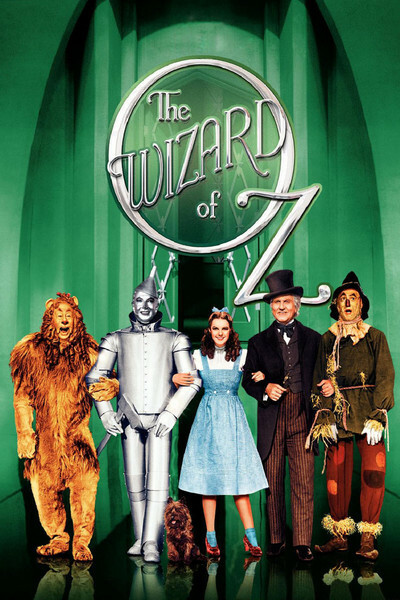 The Wizard sends them on a mission to get the Wicked Witch's broom, and it is not insignificant that the key to Dorothy’s return to Kansas is the pair of ruby slippers. Grownup shoes.